L’Atitude 51 have arranged four successive classes designed to learn about wine in a fun and lively way. Start Sept 22nd. Info on latitude51.ie Workshop / Course Detail. Donnybrook Fair have announced details of their new 8 week Wine Appreciation Course starting on the 20th of September. This course will teach all about the different grape varieties, countries of origin and the process of wine making. This course is ideal for people who have a basic understanding of wine and who would like to expand their knowledge. Extra info. Curious Wines tell me me they have a terrific evening this Friday. “We’re delighted to welcome Francesco Riccardi of Borgo Magredo for the first of our autumn schedule of events and tastings, as part of the newly launched Curious Wine Club. Bord Bia have just announced that National Organic Week 2012 takes place from 10th-16th September and will celebrate and promote Ireland’s organic sector. Organic producers and retailers and farmers markets nationwide will host events including organic farm walks, cookery demonstrations, BBQs, harvest feasts, complimentary in store tastings and talks – keep an eye out here for further updates! While they are relatively new to the commercial side of garlic growing, they have for many years been growing garlic successfully in their kitchen garden and soon became as the “Garlic People”. 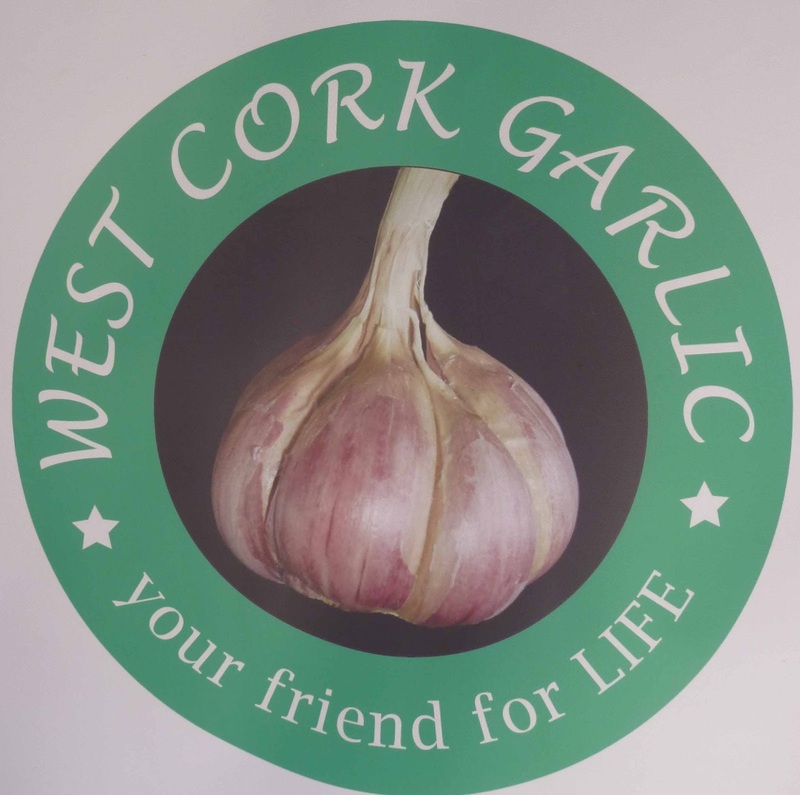 Now their garlic is used in some restaurants and for sale in shops such as URRU in Bandon and in On The Pig’s Back in Douglas. 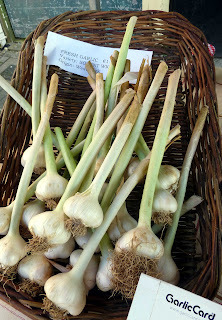 They also sell some handy garlic tools at their market stall and, if you want to sample the garlic itself in the city centre, check it out at Bradley’s, North Main Street, where I first came across it last Tuesday. 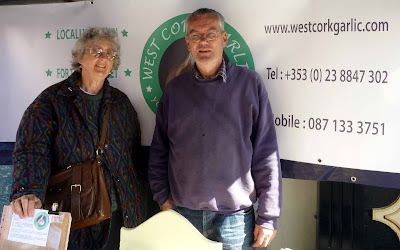 You can meet them all over West Cork at the Markets: Kinsale (Wednesday), Dunmanway (Thursday), Clonakilty (Friday), Skibbereen (Saturday) and Enniskeane (one Saturday per month). You may also like to look at their website. If you want to get sowing yourself, you don’t have that much time. Well, don’t wait until the spring as most garlic is planted in late autumn and early winter, some varieties as early as September! So let us wish the enterprising couple all the best with their big planting next season. They are doing us all a favour. 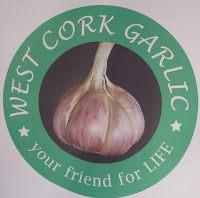 “West Cork Garlic, a welcome home-grown alternative to the Chinese garlic flooding the country,” according to Darina Allen. 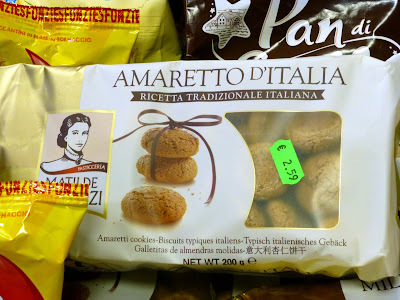 Import substitution is the name of the game here and we can all play a part, by buying from the Mirets or by planting up a patch in the back garden. Murphy’s Little Big Night Out - in the afternoon! 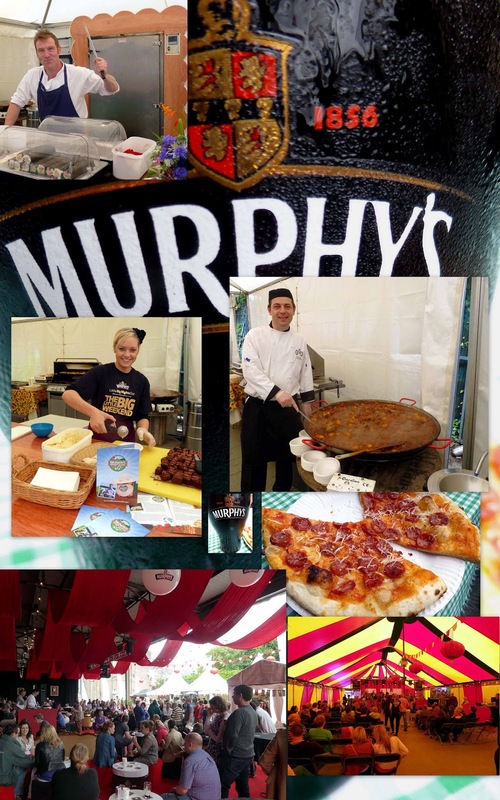 Clockwise from top left: chef Larry McGrath, chef Richard Corrigan and his stew, Volcano pizza, trad in session, Corrigan's demo and Baldwin's Ice Cream. Chef Richard Corrigan was the star as the Murphy’s series of Little Big Nights Out morphed to an afternoon of food and music at the old Beamish and Crawford Brewery in South Main Street. Dubliner Richard, self styled as the “real” Richard Corrigan, took to the demo stage to show what he could do with sea bass and that demo, with Barry Tyner acting as MC, drew the audience but it was his Irish Stew at the Bogeda stall that drew the lines of hungry punters. He is more into teaching nowadays and he told me his message to all young chefs is to get good fresh ingredients and then let the different elements, meat, fish, veg, even the humble potato, speak for themselves. No point in getting top notch ingredients and then drowning them in overpowering sauces or smothering their vital signs in marinades. The simple stew, with a well judged stout sauce (Murphy’s of course), illustrated his point. Chef Larry McGrath was also in lively form on Sunday afternoon. You’ll be seeing him soon at the Olde Bakery Market on Wellington Road. He expects to be there on Friday nights with a brand new sushi stall. Sober Lane was busy and had big queues lining up for their very tasty Chicken Goujons. Volcano Pizza is always a popular stall at these events, and at markets all over the city and county and, after enjoying a slice of their Pepperoni pizza, I now know why! Starting out with a free pint of Murphy’s Stout for everyone in the audience, it turned out to be quite an enjoyable afternoon, with quite a lot of visitors there, including a couple from the south of Spain at “our” table. In another nearby marquee, a lively day’s trad music, curated by the renowned De Barra’s Folk Club of Clonakilty, unfolded as Murphy’s Bia, Ceoil agus Craic lived up to its billing. Not a regular burger man but all that could change after polishing off a tremendous one at Greene’s Restaurant in McCurtain Street. Called in there one wet lunch-hour last week and got a gorgeous surprise when welcomed by Sylvia. We were there to try the bar food, which they serve from noon ‘til five. Knowing the work of Fred, the chef here, we expected it to be good. Sylvia confirmed that and then of course the meal itself was proof positive. Our waitress soon brought us the menu which has a soup, the Burger, a Pasta dish and a number of baguette sandwich choices, not to mention one or two desserts. Enough to be going on with. We each picked the Soup of the Day (Potato and Leek) and the Burger. Started with the soup and then came the Burger, my second of the week. 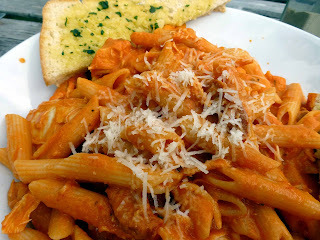 The first was a mini version at the launch of Fresco Bistro. And what they had in common was top quality meat. The Greene’s one was served with a Jalapeno relish, smoked cheddar cheese and duck fat fries. 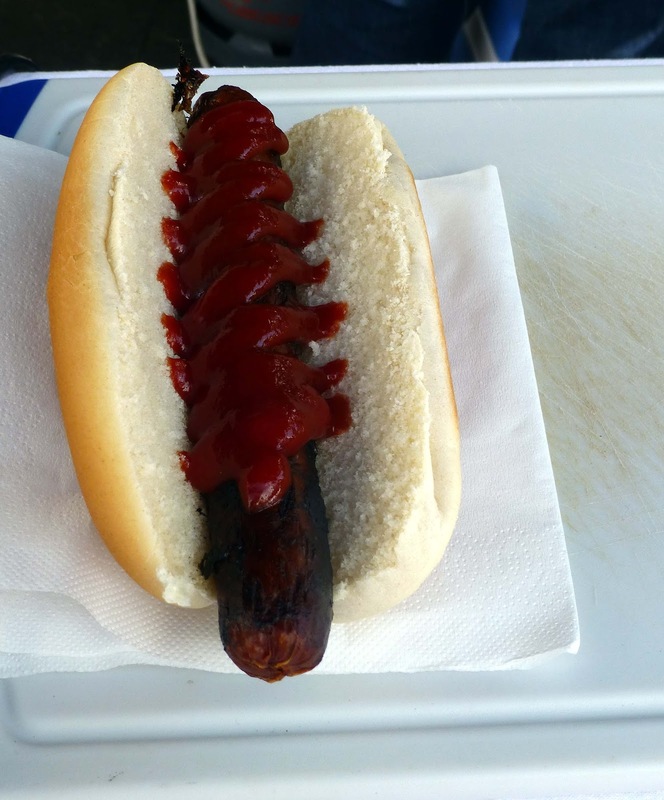 The melted cheese added to the experience as did the excellent relish, neither as red nor as sharp as some others, and the fries. Quite a lot of eating here and great value at a tenner. Oh, forgot to mention the bap. I usually leave at least half but this was so tasty in its own right that barely a crumb survived. Quite possibly the best burger I’ve tasted and glad to have had a glass of the quality house wine, a Cabernet Sauvignon, to accompany it. Excellent service too and comfortable seats in the bar area all helped. 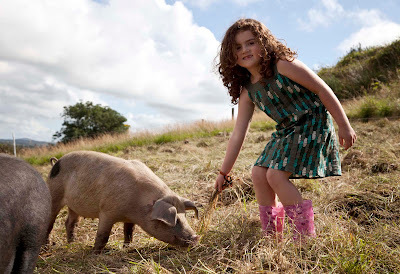 Alannah Cawley pictured at Thornhill Organic Farm, Skibbereen. Summer may be almost over and we may have missed the sun but Skibbereen is beginning to heat up for its premier festival, “A Taste of West Cork”. 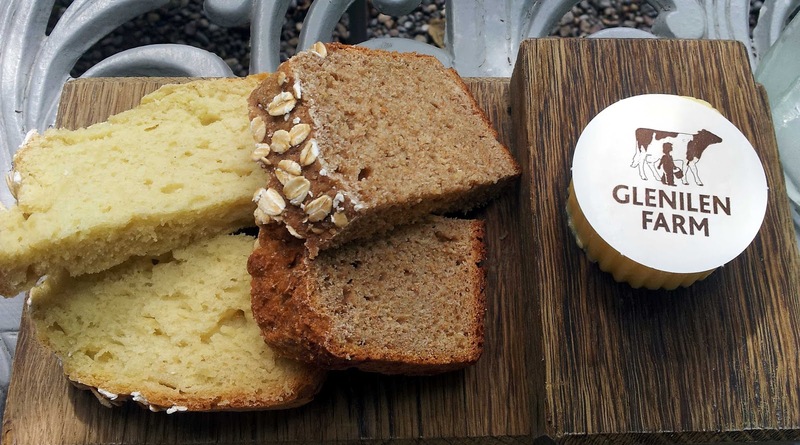 Ireland’s longest established food festival which is now in its ninth year runs from September 9-16 with a host of events to suit every taste and budget. A Taste of West Cork is the best opportunity hundreds of local producers have to get in front of people who are passionate about food. This year’s festival is set to be bigger and better with a real focus on Ireland’s food heritage. Special homage will be paid to the humble spud as the nation’s favourite tuber takes centre stage with a variety of events looking at the importance of the potato in Ireland including a special workshop by Eanna Ni Lamhna. 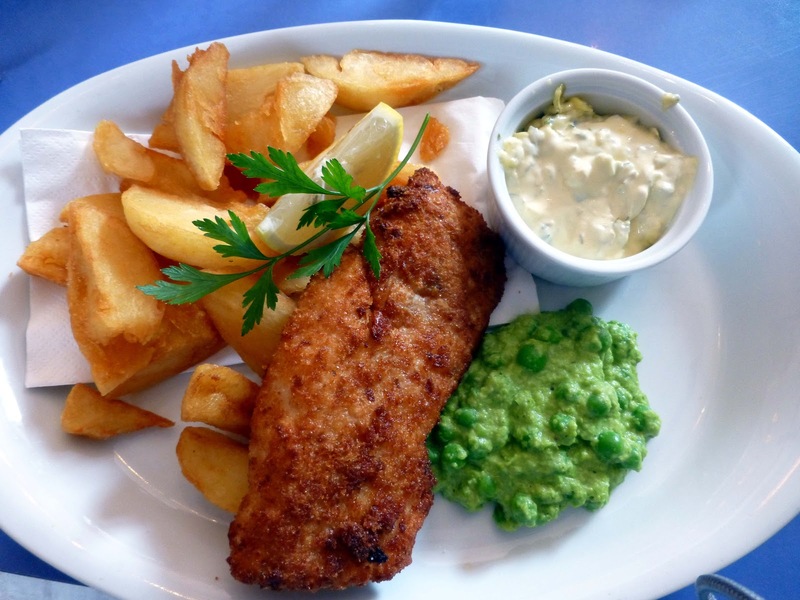 The ever popular Schools Cookery Competition will see students challenged to create unique dishes centred on the potato while restaurants around Skibbereen also create their own unique ‘spudcentric’ dishes. 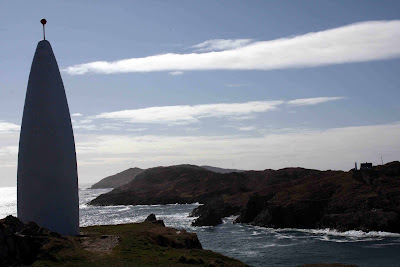 There will also be numerous workshops, tastings and demonstrations on all elements of international cuisine with the full calendar of events aiding the extension of West Cork’s tourist season. 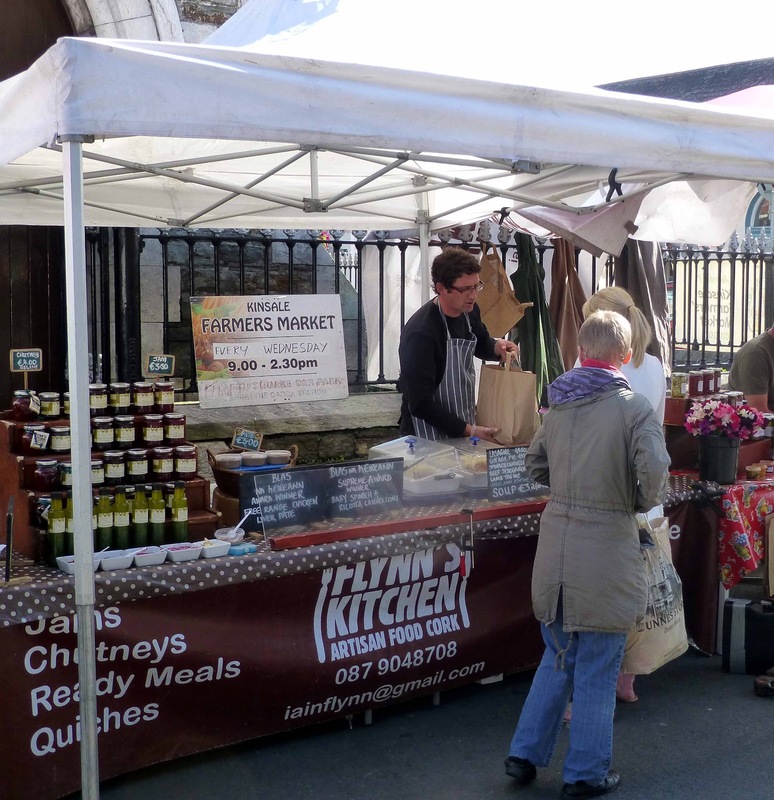 Among the list of other standout events will be the traditional open air food and craft market with over 100 exhibitors, themed nights in restaurants in Skibbereen and beyond, nutritional workshops, appearances from a host of celebrity chefs, including UK Masterchef winner Tim Anderson, traditional music nights and a special performance from one of Ireland’s best singer/ songwriters, Declan O’Rourke. This year will also see the return of the very popular Celtic Cook Off at the West Cork Hotel which will see chefs from the six Celtic territories (Scotland, Isle of Man, Ireland, Cornwall, Wales and Brittany) participate in a ‘cook off’ event in front of a live audience, whilst also aiming to impress a panel of judges. 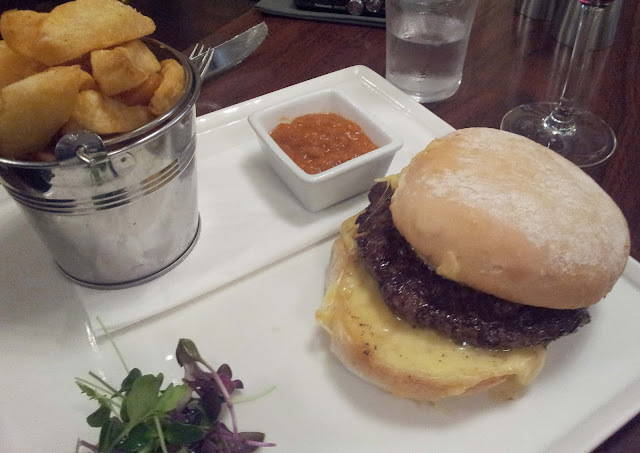 It was just about lunch-time when we arrived in Pat Shortt’s Bar in Castlemartyr last Saturday. The place was packed inside. 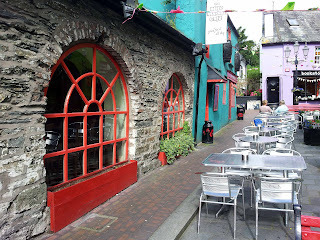 Luckily, there were seats in the outside area by the local river, the Kiltha, and so, for the second time in eight days, we dined al fresco in Ireland! And we got good stuff. The starters were terrific. I got an ample helping of Bill Casey’s Oak Smoked Organic Salmon served on a lovely brown bread (€7.50). Bill is just down the road; chef Mike Hanrahan told me he collected the fish that morning. It tasted gorgeous, really impressed. The local theme is strong here and was again well illustrated in CL’s starter: Ardsallagh Goat’s Cheese, black pudding, and pear salad, served on a bed of leaves with roast peppers and Ballymaloe Relish (€6.50). A terrific well balanced combination of textures and tastes. Had more than enough fries earlier in the week so had to give D’Unbelievable Burger a miss. 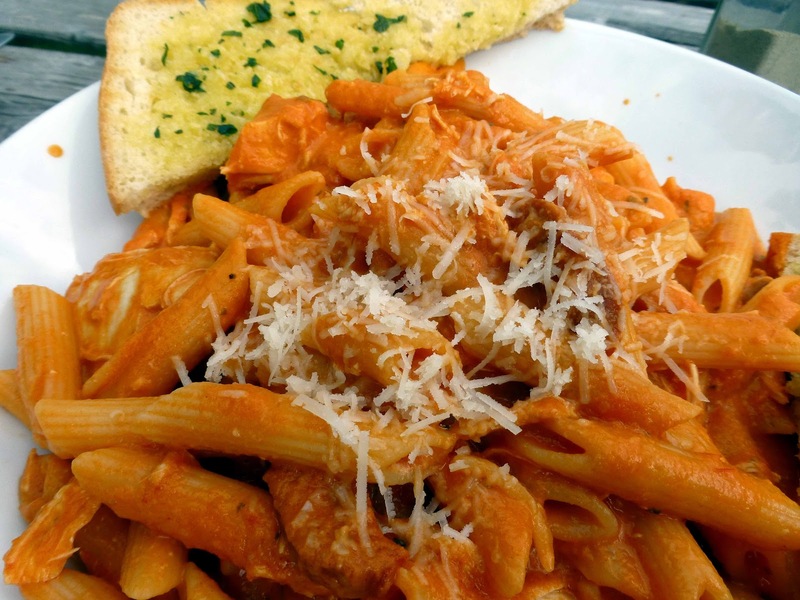 Settled instead for the Chicken and Chorizo penne pasta in a tomato and herb sauce (€10.75). Quite a bit of chicken and it was first class, the real thing, and the sauce was brilliant and gave the dish a nice lift. Polished it off in the sun and then crossed the road to the Village Greengrocer where Shortt’s get their veg. Just a few yards up is Clifford’s, his butcher. It was a busy afternoon but soon everything stopped as dozens and dozens of motorbikes came through the village. It was the members of the Gold Wing Treffen driving their bikes from Cobh to Youghal. Just another talking point on a terrific day in the East Cork area. 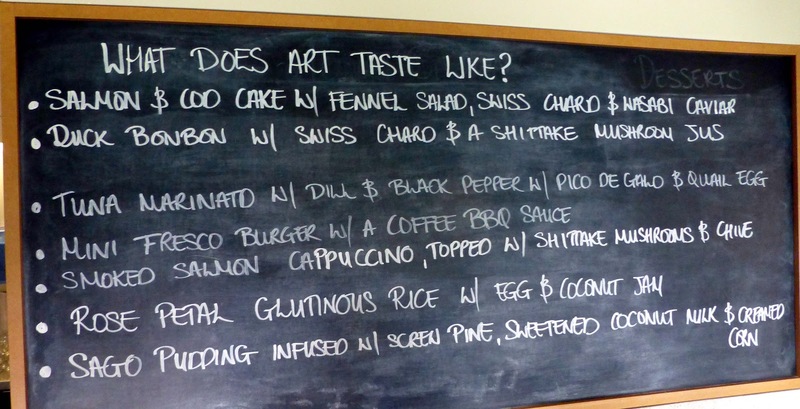 Fresco, the Bistro attached to the Lewis Glucksman Art Gallery in UCC, officially launched yesterday evening with an event titled "What Does Art Taste Like?" Music, chat and, of course, food and wine, featured. 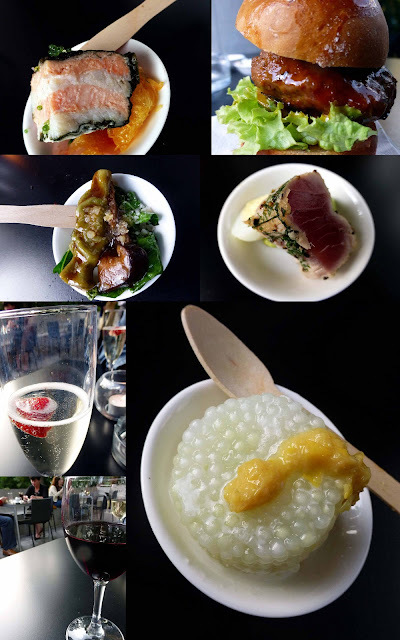 This was the menu for the evening, a mixture of hot and cold tasters. Head Chef Prakash Sivakumar was a little nervous as the first of the guests arrived. But Kash had no need to worry as his tasters were brilliant and spectacularly presented. Hard to pick a favourite from the menu (above) but my tops were probably the Duck, the Tuna and the Sago Pudding. Brian Casey, one of the principals at Fresco, told me that they have been open for over a year and that their Fresco Curry is the favourite main dish, never off the menu. That must be a good recommendation. I thought the favourite salad might be the stunning Nicoise Salad Grilled marinated fresh ahi tuna that we enjoyed there a few months back but Brian tells it is the Teriyaki of Salmon Salad, another excellent dish that I sampled at the recent food fest in Fitzerald's Park. So well done to Brian, to Kash and to all the lovely and helpful staff at Fresco Bistro and best of luck for the future. Oh, by the way. 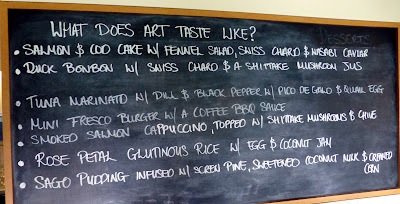 What does Art Taste Like? Just brilliant is the answer! Food and Drink Spotting. Fresh Irish Lager! No, not with the famous polar explorer from Kerry but with the lager named after him. 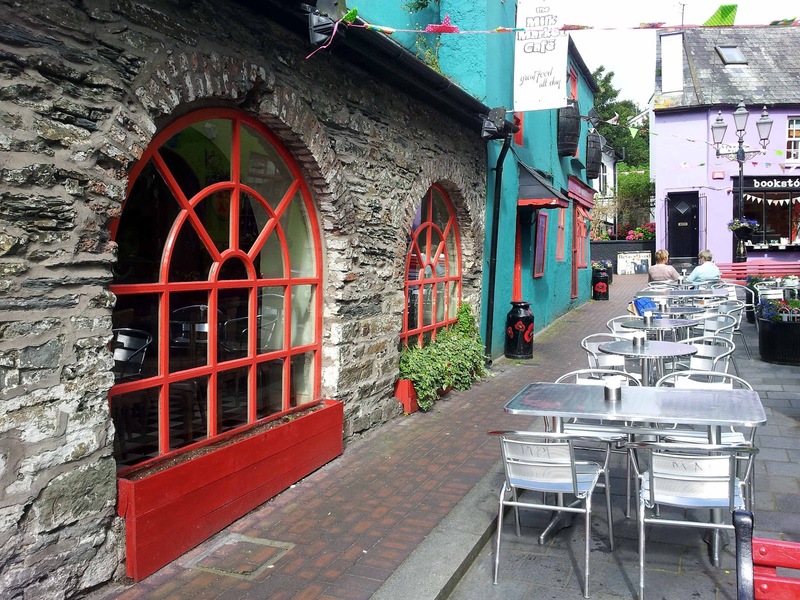 Annie’s Gastropub explain all: “We are very excited to announce that we will be hosting an Evening in conjunction with Dingle Brewing Company on Saturday, September 22nd at 6.35pm. 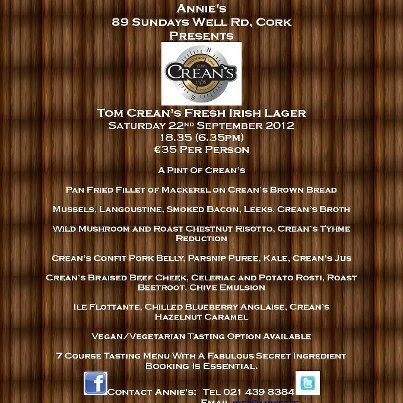 A specially designed seven course menu has been created by our talented chefs Michael, Mark & Chris, using Tom Crean's Fresh Irish Lager. Truly Irish have been awarded a gold star in the prestigious Great Taste Awards for their ever popular Roasting Back Bacon Joint. The joint, with a 25% less salt content and 1 hour cooking time, proved every bit as successful as the rest of the Truly Irish product range. This gold star now gives Truly Irish a total of 8 gold stars in the Great Taste Awards, along with bronze and silver in Blas na hEireann awards and three Grand Awards of Excellence in the European Championships (Fins Goustiers du Duché d'Alençon). Truly Irish will be present at this year’s National Ploughing Championships so make sure you visit their tent. A recent report by the UK’s Which magazine had found very high sugar content in cereal bars. Surprise. Surprise! “All but one of the bars we looked at were high in sugar, with 16 containing more than 30% sugar. While some of the sugar comes from fruit, which provides extra nutritional benefit, only the Nakd Apple Pie doesn't contain any added sugar. In total, researchers found 18 different forms of sugar in the bars. See the full Which report here. Matt, of Curious Wines, has been singing the praises for their upcoming Wine Beginners Course. “It is the perfect introduction to life’s elixir, covering all aspects of wine from how to taste, understanding labels and how wine is made, through to the major grape varieties and the famous wine regions of the world. Where: Curious Wines, Kinsale Road Commercial Centre, Kinsale Road, Cork. When: every Wednesday for six weeks, starting 19th September 2012, 7.30pm to 9.00pm. Cost: €90 (€45 for Wine Club members). To sign up, just call Curious Wines on 1800 99 18 44. But do hurry – you don’t want to be late for school! 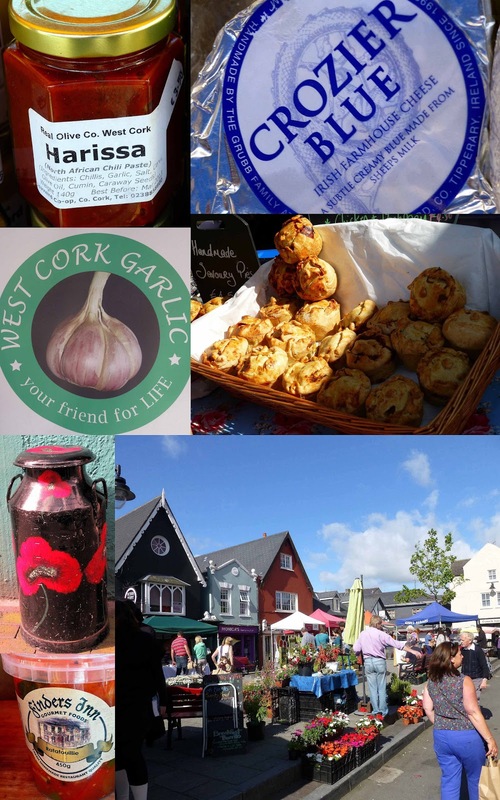 Good selection, clockwise from to left: Harissa at the Olive Stall, Crozier Blue at Mark's Cheese, Slice O' Pie, general view, Finder's Inn, Milk Market, West Cork garlic. 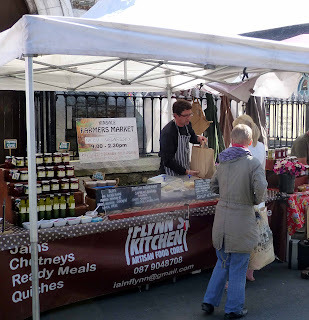 Enjoyed my trip to Kinsale Farmers Market today, meeting regualars such as Ian Flynn (below) and relative newcomers like Axel and Marye Miret (above). Did a little shopping in the town also including some fresh fish at Crafty Cod and a reviving cup of tasty Italian Coffee at the Milk Market Cafe (above). Competition is now closed - we have a winner: Michael Wall of Waterford. 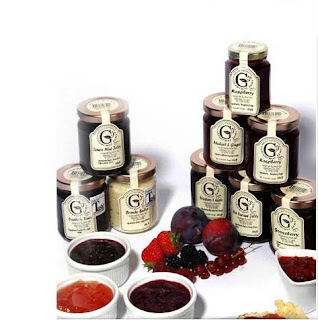 We’ve got a terrific prize for you, thanks to long established Irish company Robert Roberts who are once again celebrating a success in the Great Taste Awards. The hamper contains some of their award winning teas, coffees and herbal teas as well as a cafetiere and tea pot. Interested? Then email me at corkbilly@ymail.com with Yes Please in the subject line. Easy. The prize can be delivered to Republic of Ireland addresses only. Closing date is 12 noon on the 29th of August. Last Wednesday was the day the hurricane struck. Well, maybe not quite a hurricane but bad weather nonetheless. Still, we headed down town for lunch, stopping at Isaac’s, and not just because it was the first one we came to. Thought it might be quiet but not a bit of it. By the time we left, close to two o’clock, the place was more or less fun. For 19 years now, this McCurtain Street venue has been a popular one and it seems that nothing has changed in that regard. It is well situated, close enough the city centre, in a converted furniture removals warehouse. It is a Bistro type eatery, wooden floor rather than carpets. But it is spacious and the simple chairs have a good comfortable base and support at the back. Service is top notch and also friendly. 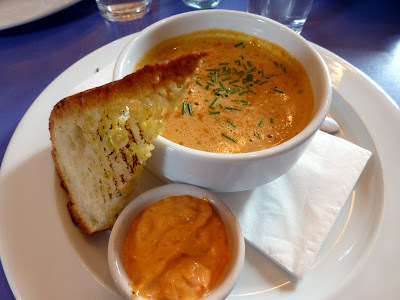 I picked my starter from the day’s specials: Lobster Bisque with croutons and rouille. An absolutely superb soup with a little extra added by the rouille (a sauce, often used for this very purpose in Provence). We were both very happy with that €7.50 opener. I stayed with the specials for my mains: Crispy fried crumbed Castletownbere haddock with pea puree, tartare sauce and home cut fries (€15.00). Fish and chips basically. But quite a good one. The fresh fish was lightly crumbed, the purée and sauce spot-on. 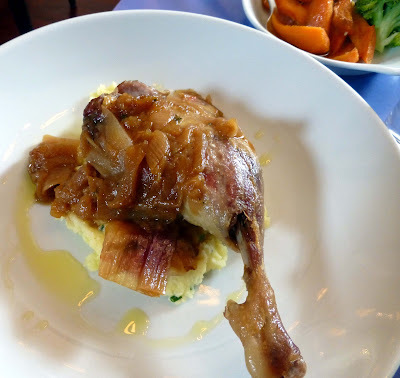 CL also picked from the specials: Duck Confit with caramelised shallots and chive champ (€14.00). Again, hardly a major challenge for the chef but again a well done dish and yet another happy customer. Make that two happy customers. Tickets for the 2012 Celtic Cook Off are now on sale and enquiries have been coming in fast. There has even been interest from as far afield as Victoria, BC in Canada! 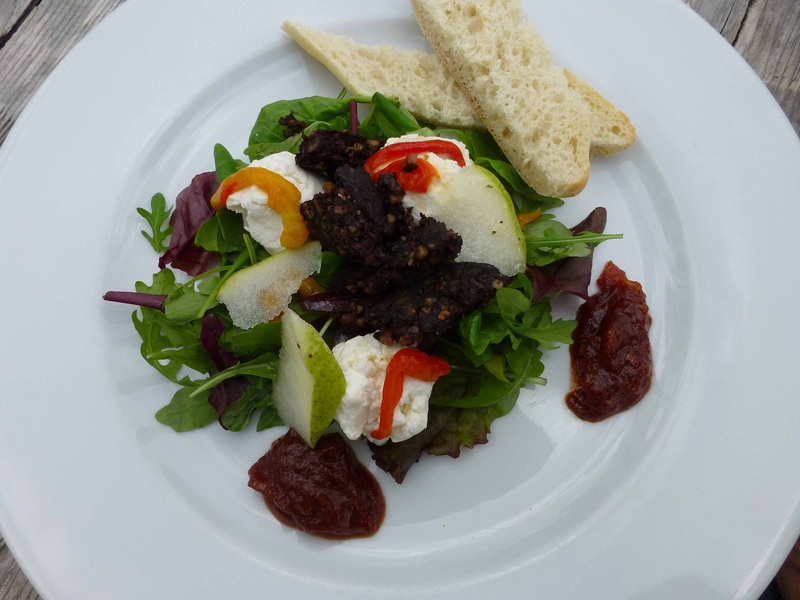 The Celtic Cook Off is held as part of the A Taste of West Cork Food Festival and has proved very popular with the paying public, the local food producers, Fáilte Ireland, the media and all the Chefs involved. So much so that four of last year’s Chefs are returning to be involved in the Festival this year – Arty Williams of Cornwall, Roy Brett from Scotland, John Dixon from the Isle of Man and our own Martin Shanahan. Scotland: Edinburgh born, Tony Singh has established himself as a leading force on the Scottish restaurant scene as co-founder of Oloroso, the highly acclaimed bar and restaurant in the heart of Scotland’s dynamic capital city. Brittany: Stephane Delourme has worked at The Seafood Restaurant in Padstow for over a decade. He joined Rick and Jill Stein as head chef at their flagship establishment when he moved to Cornwall in 1998. Isle of Man: Butch Buttery, one-time owner of Tanroagan now has a business installing restaurant kitchens; he also cooks for exhibitions and private functions as well as being chef and recipe consultant for the Manx Organic Network and Island Seafoods. Wales: Ian Bennett of The Welcome to Town Restaurant on the rugged and beautiful Gower Peninsula. Ian gathers in a cornucopia of local produce from seafood to salt marsh lamb to pork & beef executing his dishes simply with a contemporary touch! Cornwall: Jack Stein of The Seafood Restaurant, one-time sous chef at the restaurant now has a tournant role across the whole company and is currently the Head of Development, leading the introduction of a development kitchen for the business, where new recipes and ingredients will be tested. €15 each including glass of wine at the end to toast the winner, but please note, tickets from 10 September will be €20. Seating limited so book early to avoid disappointment! Like my Pu-erh and Rooibos but used to stick my nose up at the mention of green tea. Not anymore. Came home from town on a recent muggy day, in need of a pick me up. 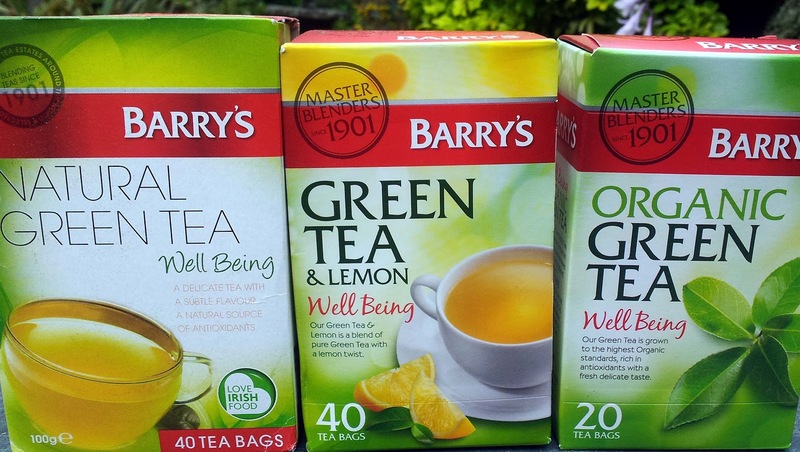 Spotted a parcel from Barry’s Tea and inside were three packs of green tea! Not used to Green Tea? The leaflet asked. “Then try our Green Tea and Lemon.” Not expecting much, but I tried it. Well, well, well. It certainly is refreshing, a pleasure for the nose and the palate and it must be all those antioxidants that gave me the boost. I sure was willing to experiment after that and, the next day, tried their Natural Green Tea. No lemon here but the zest remains, the antioxidants are still at work. It is not unlike the black teas but not as robust, being more delicate with a subtle flavour. Liked that too. 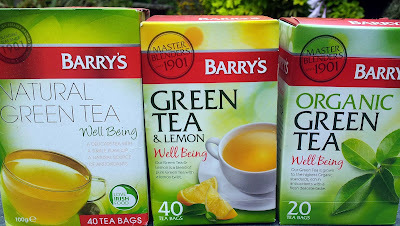 I next moved on to the Organic Green Tea – all three are part of Barry’s Well Being series. This too is “brimming with antioxidants” and I didn't find the taste much different from the previous tea. There are some minor differences in the standing time when making these teas. Keep an eye on those and you’ll have the perfect green cuppa. And please, I’ll have one also! Clarion Hotel Cork tell me that their Kudos have the following Dinner Specials until Tuesday 21st August. Sizzling Crispy Honey and Chilli Glazed Duck, Asian Seasoned Ginger Vegetables, Sesame Rice €15. Cajun Dusted Pork Loin, Sweet Onion Mash, Spiced Apple and Raisin Salsa, Balsamic Drizzle €14. Chef Kash is looking forward to the official launch of Fresco Eaterie and Bistro next Wednesday! To celebrate, Fresco are giving away ten invitations to what will be a great night! If you want one please send them a direct message (twitter address: https://twitter.com/frescobistro ) saying why you want to go. ‏@BubbleBrothers €48 off this case of young, fruity whites http://bit.ly/RVy9OX. Rhône, L'doc, Valencia. Promo price good ‘til 5pm Sat, or ‘til stocks run out. A hand drawing of the Shiraz leaf distinguishes this bottle on the shelf. 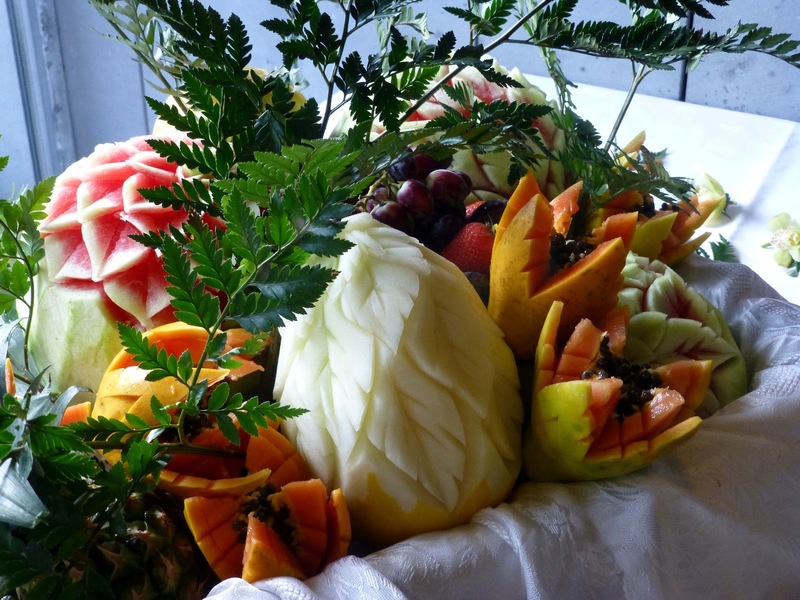 Its classy contents, full and fruity, distinguish it on the table. A must try for any Shiraz fan. The nose of dark fruits, liquorice, and chocolate is spicy and warm while the complex fruits, superbly balanced, delight the palate. 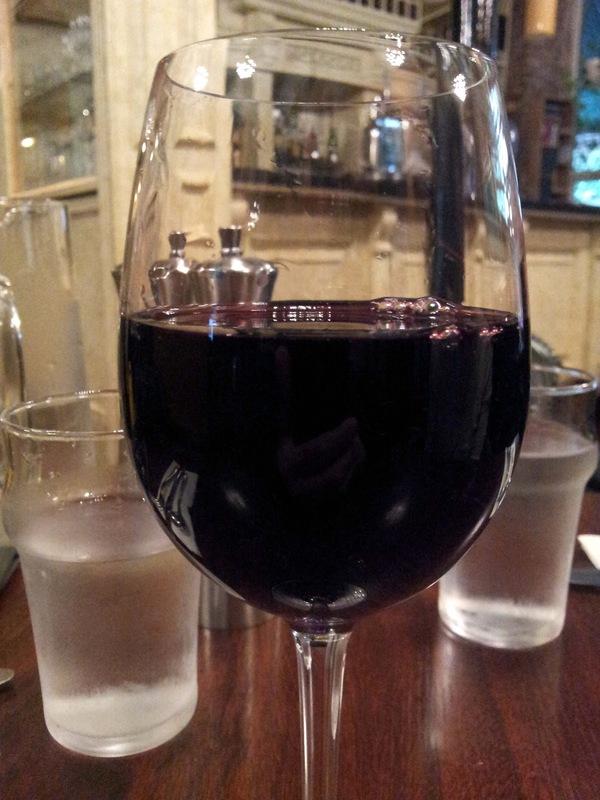 It is surprisingly smooth, with super length, and has second glass appeal for sure. Highly recommended. This wine, made with 60% merlot, has dark fruits (cherry and blackberry, I detect) on the nose. It is medium bodied with an excellent texture, a good balance of fruit and acidity and good length on the finish. It is well made and I found it an excellent match with steak. An excellent wine from a highly regarded producer and a very good example of the Superieur. Highly recommended. Going for the hat trick here and this, from Portugal, sure didn’t let us down. It is fruity and dry, with slight spice; no extremes as it is well rounded, smooth for sure and with a long finish. This unfiltered wine is made from the following grapes: Touriga Franca, Touriga Nacional, Tinta Roriz and Tinta Barroca. Another for the Highly Recommended category. Like Tempranillo? You’ll love this. It’s quality all the way here. The fruits are hand harvested and then the best bunches are selected before it is aged in French and American oak. Tinta Del Pais, in case you don’t know, is another Spanish name for Tempranillo with which most of you are no doubt familiar. If you like the Temp, then you’ll love this. 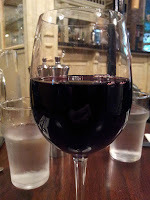 It is quite a dark red with plum, cherry and subtle spice on the nose. It is fruity and juicy, no shyness here, and the palate will willingly take it all onboard. It arrives with a flourish and the lingering finish isn’t bad either. Similar in style to Rioja. Good value. Highly recommended. Having worked up an appetite during an amazing sunny morning on The Vee, we dropped down to Lismore and sought out O’Brien’s Chop House for lunch. Best decision of a very good day in the area! 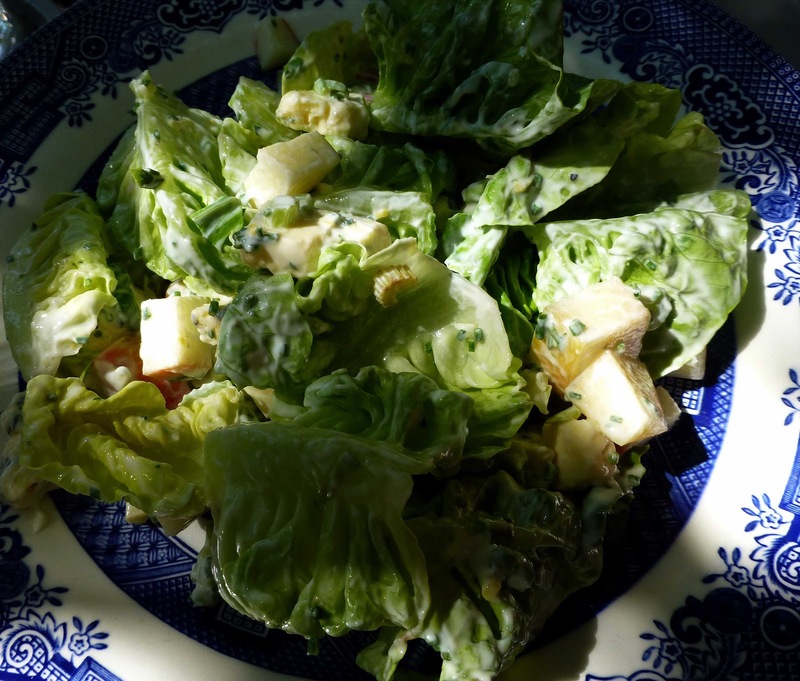 The lunch, in the garden, was top drawer. Local food - they get their meat from McGrath’s on the main street - served simply, as they say themselves. Simply superb! We got a lovely greeting from Richard Reeve and his friendly and efficient staff and were soon at our table, under the dappled shade of the garden trees. A really smashing facility and what a pity it hasn’t seen very much use this grey summer. Still, they have plenty of seats indoors and indeed many were taken up for lunch. 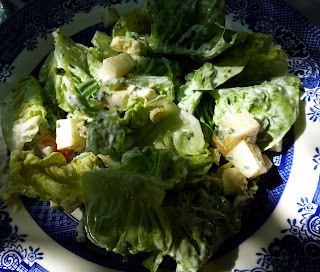 One of our starters was the Apple & celery salad with toasted hazelnuts, Cashel Blue and a yoghurt dressing (€7.90). 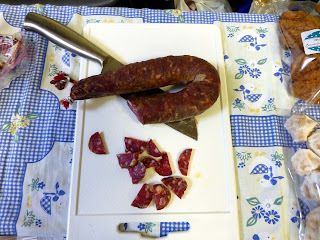 It wasn't mine but I did get a few samples and it was gorgeous, a brilliant combination of textures and flavours, really well balanced. 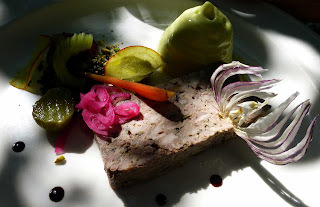 Very pleased too with my own choice: Ballyvolane saddleback pork terrine with pistachio and pickles (€8.90). Looked well and tasted well. 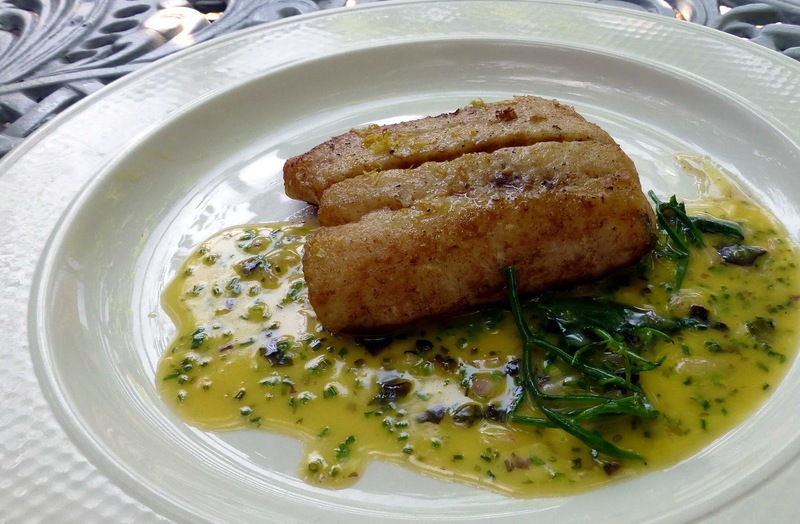 We both agreed on the main course: fillet of Hake with sea vegetables and a lemon/butter sauce (€21.90). The Hake was cooked to perfection and the sauce and vegetables were an apt accompaniment. The sea vegetables were brilliant, comfortably crunchy and with a robust taste. Oh and we also got some tasty spuds! Highly recommended, if you get the chance. 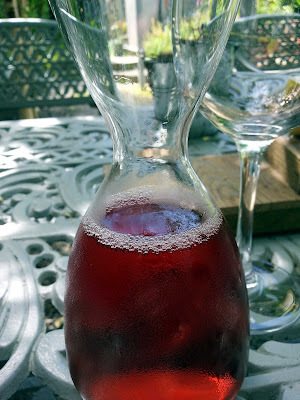 With the sun beating down, the rosé was always a likely wine choice. O’Brien’s have a gem: Artadi Artazuri Garnacha 2010 from Navarra, €7.25 per glass, also available in 150ml pitcher, 250ml pitcher and full bottle. 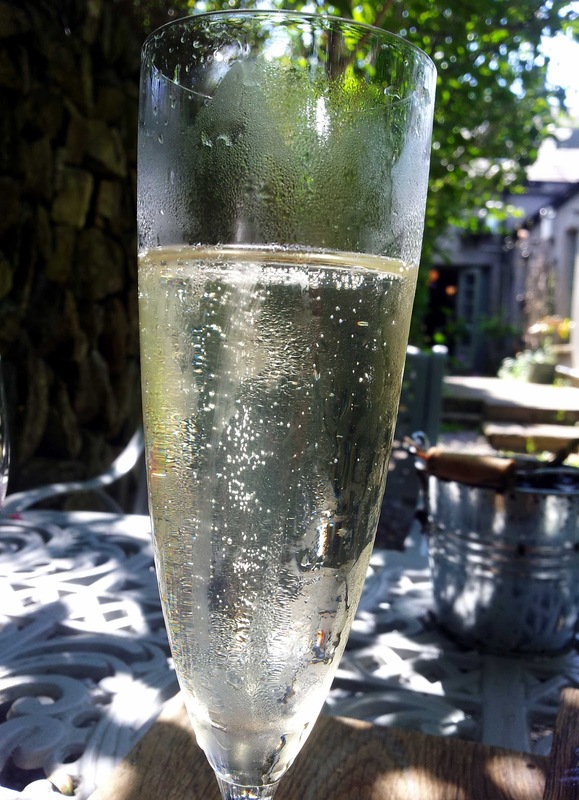 But the drinks highlight for us was the Elderflower Bellini (€7.95). The Prosecco provided bubbles galore and there are inviting scents and flavours via the Elderflowers. Well worth a try! Saw the Badger and Dodo logo in the bar on the way in, so guessed the coffee would be good. It sure was, sterling stuff. Excellent way to finish off an excellent meal. You Can’t Beat a Beetroot! You can;t beat a beetroot, says The Butler's Pantry Executive Chef Niall Hill who reckons he has cracked this beautiful purple gem. Luckily, Niall loves to share his recipes using traditional Irish ingredients that are in season and easily accessible; taking a classic ingredient and putting his own modern twist on it. “I love experimenting with every new season’s ingredients, their different flavours, colour and textures. In season this month we will start to see root vegetables such as celery, beetroot, carrots, parsnips and swede. Beetroot is one of my favourites as there are so many ways to enjoy this purple jewel and awaken your taste senses”. Root vegetables were very accessible as they were not difficult to grow and store. Beetroot evolved from wild seabeet, which is a native of coastlines from India to Britain. 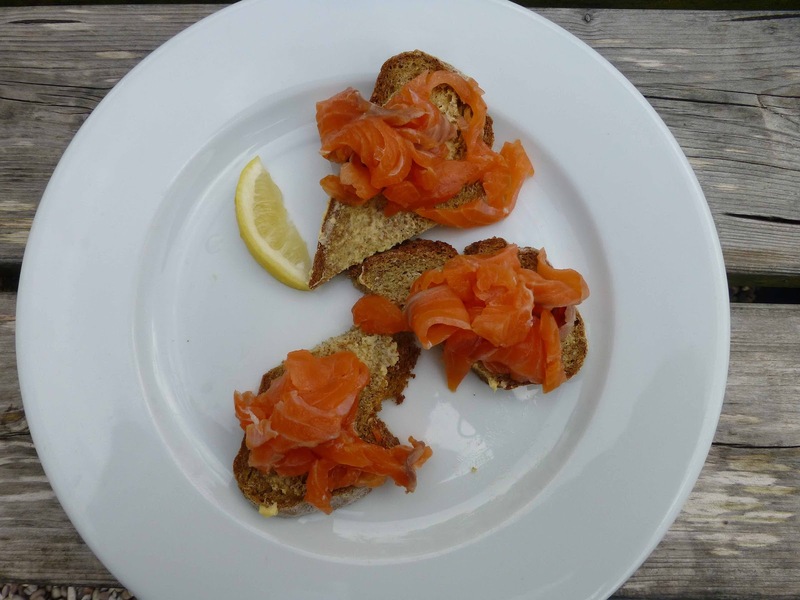 As with a lot of traditional ingredients in Ireland throughout the last century, they have been influenced by what was accessible across the British Isles. Nutritionally beetroot is famed for its ability to purify the blood and kick start the liver. Many people are averse to beetroot, familiar only with the pickled variety. Fresh beetroot has so much more to share in terms of flavour (sweet, slightly earthy), texture (smooth and velvety) and colour (dark red/purple). In the kitchen, try it cooked, peeled and in a salad, roasted for Sunday lunch, as a refreshing consommé or create a delightful feast for the eyes in a delicious risotto. 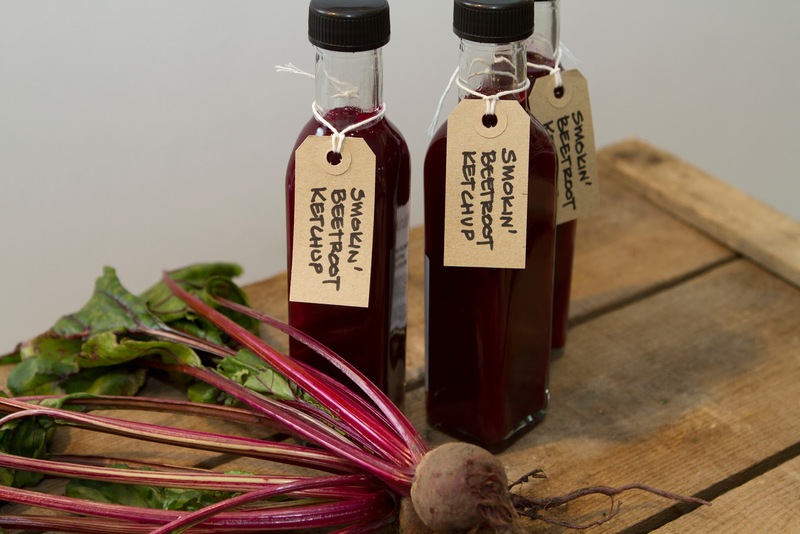 Beetroot makes a great ketchup which goes fantastic with a rosemary grilled chicken, cold cuts and a cheese board – see Niall’s recipe below and he also has a smoked beetroot variety available in The Butler’s Pantry shops. • Season to taste, chill and serve cold. 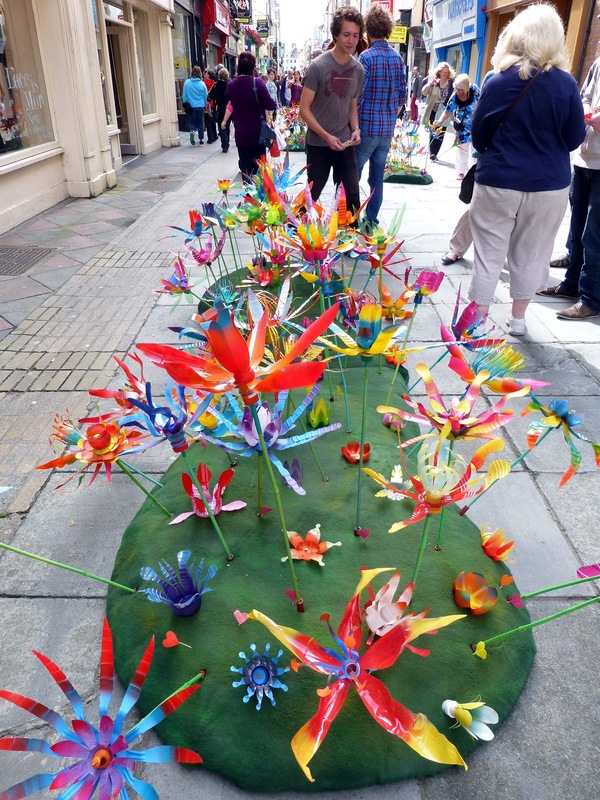 Waterford Gears up for huge Harvest Festival! 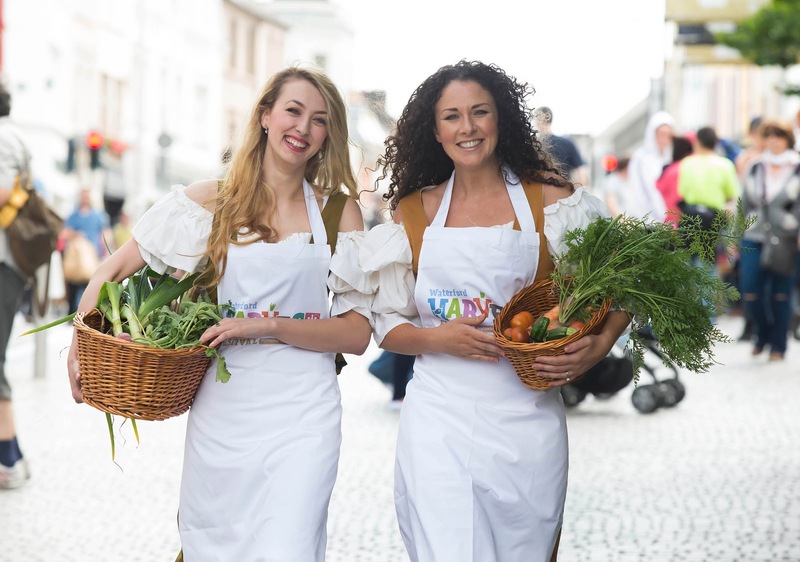 Waterford City is gearing up to host the country’s biggest food festival ‘Harvest’ from September 10th-16th which will feature a variety of Ireland and the UK’s top Celebrity Chefs at locations across the historic city centre. Neven Maguire, Kevin Dundon, Darina Allen and Richard Corrigan will all be out en force to showcase their culinary skills in addition to BBC’s Martin Dorey, the presenter of the hit TV series ‘One Man and his Campervan’ and author of the Camper Van Cookbook. Slow food tours, wine and whiskey tasting, giant street markets, an artisan beer festival, cookery demonstrations, restaurant trails, a family fun day and lots of music and entertainment have been lined up to satisfy all appetites throughout the weeklong festival. The 2012 GIY Gathering will take place in the city during the Harvest festival and sees BBC’s Alys Fowler and Mark Diacono of River Cottage join a host of Irish stars on September 15th & 16th. The GIY Gathering will also include guest speaker Roger Doiron from the US, the inspiration behind Michelle Obama's White House vegetable garden and founder of Kitchen Gardeners International. “We are delighted to announce details for the fifth year of the Harvest Festival. Last year over 50,000 attendees came to the city during the Festival and we are confident that this year’s diverse & exciting programme will attract many more. Harvest Waterford is always a celebration of great Irish food and we’re particularly proud to showcase the culinary range & expertise of the region which makes this Ireland’s largest food festival’. 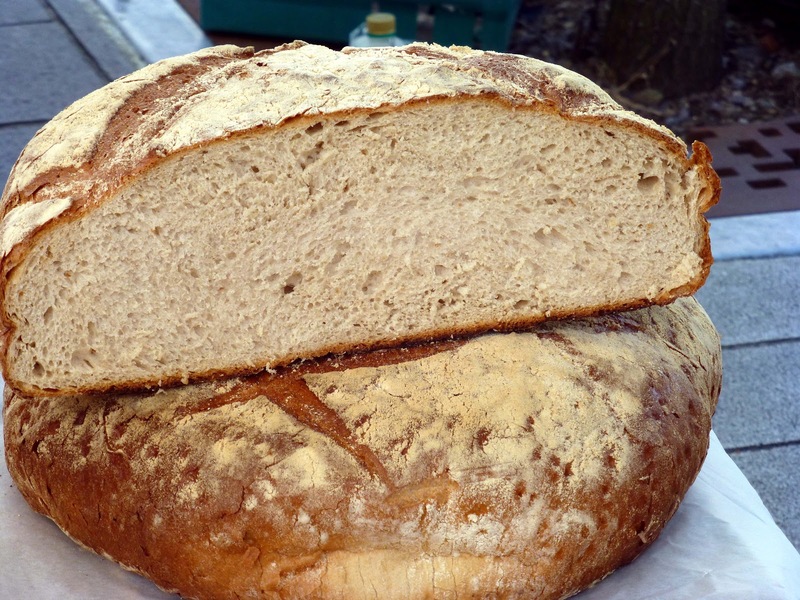 Festival-goers of all ages can also enjoy a traditional harvest celebration. We have everything from a ‘Revival of Forgotten Skills’ workshop to a Tea-dance, a Threshing display and a real Farm which will be positioned in the centre of our ancient city”. Festival highlights include the Festival opening on Monday, September 10 with cookery demonstrations in the City Centre and a Curry war! Other highlights will include the National Young Butcher Competition, a Good Food Ireland Showcase, Artisan Beer Festival & BBQ and ‘Sunday Best’ - the largest open-air food market in Ireland which will see Waterford’s South Quays and John Robert’s Square transformed into a giant market place. The annual GIY Gathering which will take place during Harvest brings together some of the world's leading experts and advocates on home-grown and local food from Ireland, the UK, US and New Zealand. 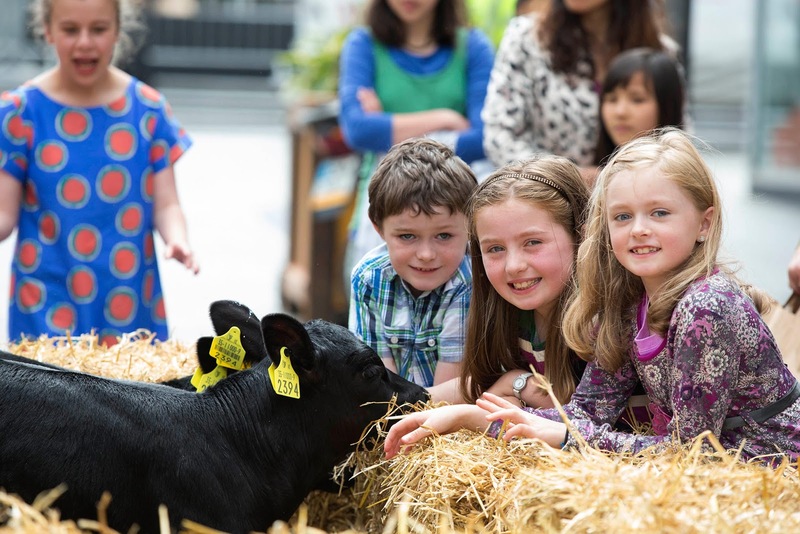 The event will bring together up to 400 people from around Ireland for a two-day festival of learning about growing your own food in Ireland’s oldest city. Commenting at the launch Gary Breen, Failte Ireland said, "We are delighted to support the Harvest Festival in Waterford, Ireland's biggest food festival. Food plays an invaluable role in driving tourism in Ireland, we are a nation abound with the highest quality fresh produce and festivals like the Harvest festival carry this ethos. Last year the Harvest attracted no less than 50,000 visitors and judging by the wide and varied programme unveiled today, we are sure it will be an even greater success this year." 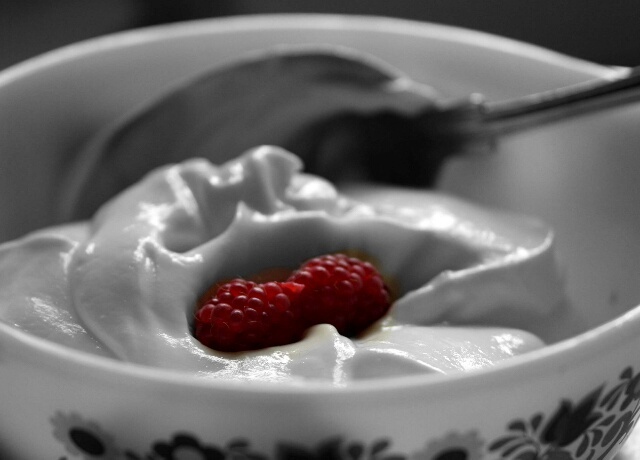 Glenisk Natural Yoghurt with fresh Raspberries. They tell me it’s not all about wine at L’Atitude 51. “We also love and serve great coffee. So, in association with Badger & Dodo, our gourmet coffee roaster, we are offering a coffee tasting, or ‘cupping’, session – the first of its kind to be held in Cork. The session will take place in our Wine Workshop where you’ll be able to sip and sniff your way across a number of beans and blends. Cupping is similar to wine tasting where comparisons can be made between varieties, coffee sampled at different stages of the brewing process, and aromas and after-tastes analysed. This session will be a fun approach to cupping – an introductory lesson to let you know what happens to the coffee from crop to cup, how roasters assess their coffees ... and we’ll even let you have a go at tasting and assessing for yourself - you’ll taste some very real differences in coffees from different origins! The event takes place on Wednesday 15th August @ 7.00pm in our Wine Workshop on the 1st Floor. Admission costs €8 - this includes a 250g bag of gourmet coffee to take away. As numbers are limited, booking is essential - so if you’re interested, email us info@latitude51.ie or call us on 021 2390219. Congratulations to Gareth Scully, the Master Coffee Roaster, at long established Irish company Robert Roberts whose Java Beans were one of only 120 products out of 8,800 to win 3 stars in the Great Taste Awards in London. A unique family-friendly cookbook, a source of inspiration for modern healthy living, a keepsake for the loyal fans of the restaurant, a memento for visitors to Galway, a celebration of the enduring energy of Ard Bia and all involved in it. That is how the Ard Bia Cookbook, published by Cork University Print, is being described. “Ard Bia is about expecting great local food with an unusual twist, the best of Irish produce served with a little exotic magic: seasoning Atlantic scallops with tangy sumac, indulging pomegranate cake with freshly whipped Irish cream, pairing produce from local artisan heroes such as butcher-turned-charcutier James McGeough with eclectic influences from the Middle East and beyond. The book represents a day in the life of Ard Bia, with the first five chapters taking the reader through the various times of day, from morning through lunchtime, mid-afternoon snacks through evening supper or dinner, finishing with something extra, sweet or cheesey. The final chapter is an important element of the book. This pantry section can contain much of the overflow of information from other chapters, and will be a go-to for further explanation for novices. Rozanne Stevens gets her teeth into Clonakilty Black Pudding. You'll have Time for a Quart? Have You Time for a Quart? West Kerry Brewery’s Carraig Dubh Traditional Porter, 5.5% abv, €3.99 at Bradley’s, North Main Street, Cork. 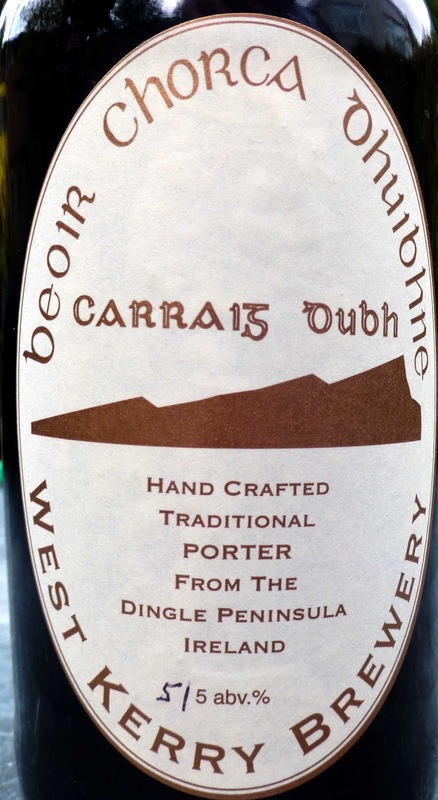 This hand crafted porter from the West Kerry Gaeltacht is sold in 50cl bottles. It is bottle conditioned and made from malted barley, hops, yeast and spring water “from our own spring”. Not very much information on the website. 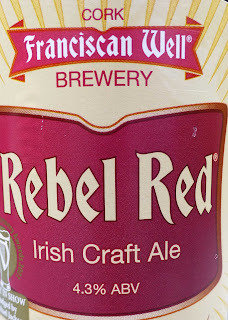 The email address is brewery@tigbhric.ie. Colour, you’ve guessed it, is black (dubh) with a fragile creamy coloured head. Nothing fragile about the rest of it. The introduction to the palate is smooth, seductive, chocolate-ly and there is no letting go as the lingering finish is along the same lines. One to sip and savour, arís is arís. 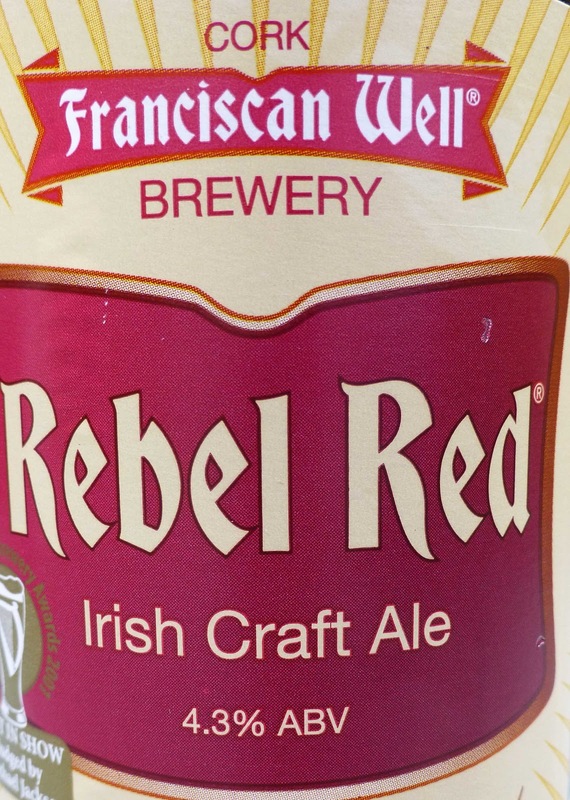 Franciscan Well’s Rebel Red Irish Craft Ale, 4.3% abv, part of 4 for €10.00 deal at Bradley’s, North Main Street. An award winner back as far as 2001 but only recently available in bottle (50cl). Ingredients are water, malted barley, English hops and ale yeast. The back label is crowded but has very little info on the ale itself. You can go to the brewery site for more details. There is a mild hoppy aroma on the nose and an inviting creamy head on an amber/red body. Engaging mouthfeel, full flavoured with a lip licking malty sensation before a good dry finish. Well balanced. Go on. Have a cut, as we say around here. 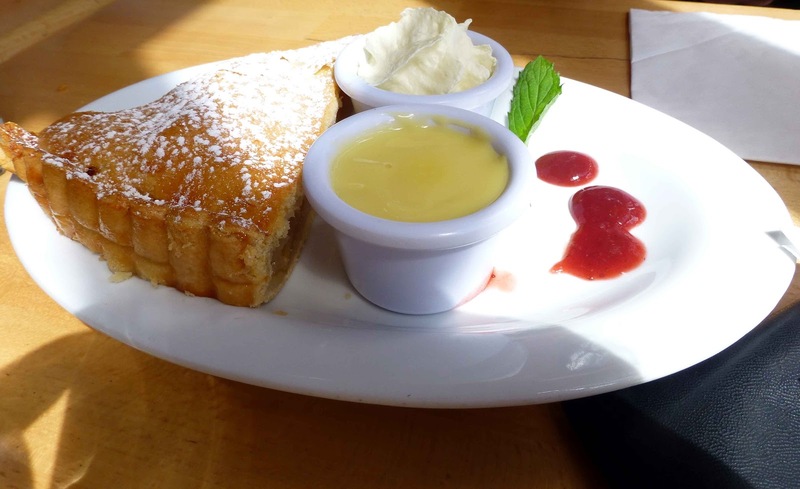 Granny Griffin’s famous Apple Pie was on the menu last Friday when we visited the Garden Restaurant at Griffin’s Garden Centre in Dripsey. 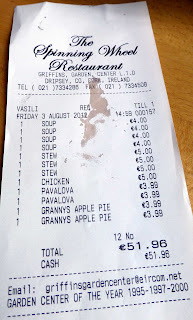 It wasn't the only highlight as it was Fiver Friday, meaning that some main courses were available at a fiver. Indeed, the prices are always reasonable here as you can see from the bill, everything a fiver or under! But don't worry. 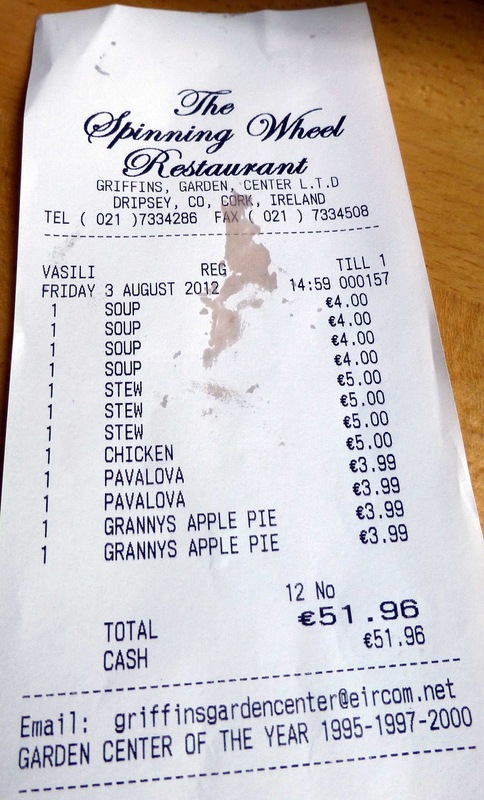 Prices may be keen but the quality is there, certainly in that delicious Apple Pie. It went down a treat. So too did the expertly produced Pavlova, the real thing. It was quite a dull day but this comfortable restaurant is bright thanks to acres of glass and looks out on to the colourful shrubs and flowers in the Garden Centre, a lovely room and also quite a busy one at lunchtime. On a better day, you have the option of eating outside where the tables overlook the river. Quite a few people, most in fact, opted for the self service option and that moved along smoothly. We were served at the table, with friendly efficiency and courtesy. 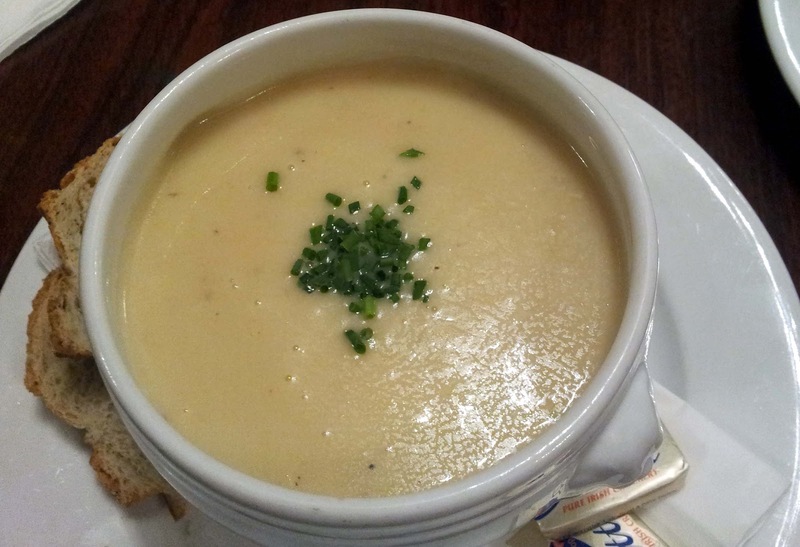 We all went for the Vegetable Soup as a starter and this was well up to scratch as was the brown bread. Now what kind of mains would you get for a fiver? How about a beef stew? Griffin’s support local producers and the beef came from Aghabullogue; you can’t get more local that that. It was excellent, a lovely stew. 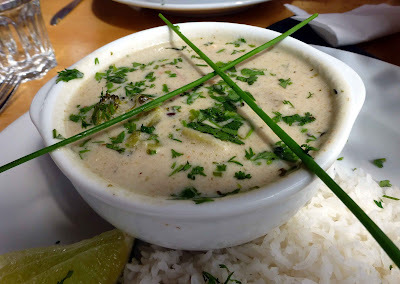 The other fiver special on offer was a Thai Green Curry and that too was top notch; Chicken was well cooked and those bowls for both the beef and curry were quite substantial. Still, there was room for dessert including that famous pie. Next time, I’ll have to get a photo with Granny and will even wear a hairnet if necessary! 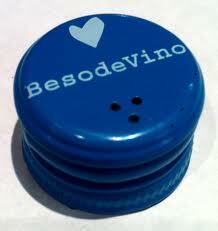 Beso de Vino, Seleccion 2010, Cariñena (Spain), 13.5%, €9-11, stockists. Many of you will be glad to hear that Beso de Vino have released the 2010 Seleccion, a delicious blend of 85% Syrah (15 year old vines) and 15% Garnacha (40 year old vines). Antonio, the little bull, has declared besos otra vez (Kissin’ time again). And why not. The Beso de Vino bottles have been very popular since introduced by Wine Alliance a couple of years back and their Maurice O’Mahony reckons they just keep getting better. Colour is red, bordering on black, while the nose speaks of Cherry and Blackberry. Flavour flows from the first sip; it is moderately spicy, soft and dry with a decent finish. Besides it has a stunning quality/price ratio. It may not be a very complex wine but it is very good. Highly recommended. For those of you not familiar with the Beso de Vino bottles (the words mean Kiss of Wine), you will have the pleasure of meeting Antonio, the small but perfectly formed cartoon bull on the labels. He is a friendly fellow, not adverse to a kiss himself. Now that last sentence is a bit of toro (tarbh)!